What Effect Does Student Debt Have on Home Ownership? Millennials are doing things differently than previous generations, especially when it comes to homeownership. Compared to just a couple decades ago, first-time home buyers today are delaying home purchases and renting for longer – and most are millennials. The low rates of homeownership in this demographic have been primarily blamed on overwhelming debt from student loans. After all, Americans owe a combined $1.2 trillion in student debt. While student loan debt can impact an individual’s ability to save for a down payment or qualify for a mortgage, new data suggests it is a myth that student debt is the reason homeownership rates are low among recent graduates. As long as you get a four-year degree or higher, the effect of student debt is actually negligible on your probability of becoming a homeowner. If you obtain a bachelor’s degree with no student debt, you have a 70 percent probability of owning your home. Someone who graduates with the same degree and $50,000 of student loans has a 66 percent probability. The likelihood of homeownership only drops a measly 4 percent even with $50,000 of undergraduate debt. For married couples, the key is getting at least one degree between the pair. If at least one spouse has a bachelor’s degree and no student debt, the couple’s probability of homeownership is 69.8 percent. Add in $30,000 of student debt for that degree and the probability drops a mere 2.1 percentage points. Getting approved for a loan or saving for a down payment might take time but the research shows student debt isn’t a major hurdle in homeownership, whether you’re married or single. Graduate school loans have an equally minor effect on homeownership. Obtaining a masters, medical, law or doctorate degree actually insulates you from the adverse effect of student debt when you buy. The probability of homeownership is highest for individuals with a doctorate and no student debt; they have an 87 percent chance of owning homes. That likelihood only drops to 84 percent if the individual incurred $50,000 of student loans obtaining the doctorate. At the master’s degree level the probability falls from 80 percent if you have no debt, versus 75 percent with $50,000 in student loan debt. Getting an advanced degree increases your overall likelihood of owning a home, despite the small negative impact student loans have on your probability of homeownership. Individuals with an associate’s degree or no degree are impacted the most by student debt. The probability of homeownership drops from 73 to 57 percent if you obtain an associate’s degree with no student loans versus carrying $50,000 of debt. And for those with no degree, homeownership probability is even lower. The probability of homeownership is 48 percent for an individual with no degree and no student debt and declines steadily with the debt amount. 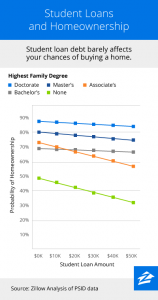 Getting at least a four-year degree significantly increases your odds of owning a home. The outlook is positive for millennials who want to become homeowners. Not only should student loans have a minor effect on ownership, the research reveals millennials who put down 5 percent and spend 30 percent of their income on a mortgage can afford 70 percent of for-sale homes on the market. While this inventory isn’t spread evenly across the country, buyers who focus on properties in the Midwest and South can afford as much as 86 percent of the for-sale homes. In major metro areas, the pickings are much slimmer; millennials can only afford 25 percent of the inventory in Los Angeles and 27 percent in San Diego. Location is key to affordability, especially for individuals also balancing student loan debt. Recent graduates should not shy away from exploring their options. It’s surprising how many homes millennials can actually afford, despite their student loan debt. Satinder Haer writes about home improvement, design, and real estate for Zillow and other partners.